It does not matter which class you travel, in a reserved seat or in the SW, it's still long to go. The exhausting hours of traveling by train will brighten an audiobook or music, when you get tired of looking through the window under the clatter of wheels. 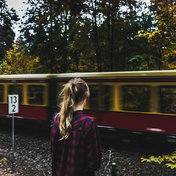 Listen to the collection For traveling by train in high quality, absolutely free. You can listen to the whole collection, or separately song by song. In addition to For traveling by train of the collection, you can find any other one by following the link and get information with the already collected collections and collections of tracks, songs and music.